For the most part the clothing you see at Anthropologie is unique. 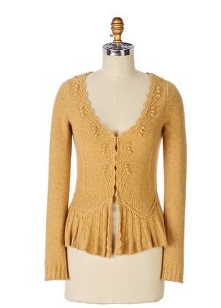 Sometimes though Anthro presents its spin on a trend. These are the items that give you a bit of deja vu. I like bows just as much as the next girl. This fall bows have been everywhere, especially on cardigans. In some cases I think the accent is successful and in some cases less so. 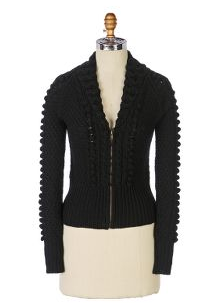 Another big trend this fall is having accents in clothing pieces rather than wearing jewelry. This is usually accomplished with flourish around both around the neckline and the wrist. I have seen many pieces with marble-like fabric covered beading on pieces, which I’ve taken to calling berries. Do you like either of these trends? What other trends have you noticed Anthropologie showcasing? 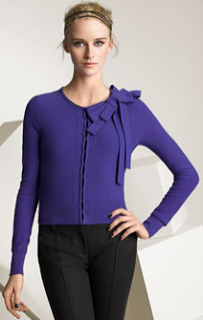 I own the JCrew berry Astrid in purple. Love it! I do love the Berry Astrid! It has a chic Chanel vibe to it. Unfortunately it didn't fit me very well.